Provide comfort for the family of CATHERINE HANKS with a meaningful gesture of sympathy. 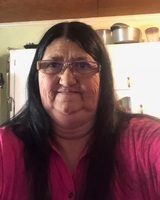 Funeral Services will be held on Monday, February 4, 2019 at 2:00 in the Duhon Funeral Home Chapel in Crowley for Cathy L. Hanks, 57, who passed away at her home on Friday, February 1, 2019 at 6:44 A.M. in Crowley. Pastor Joey Dugas, Pastor of Jesus Worship Non Denominational Full Gospel will be officiating for the services. Burial will be in Woodlawn Cemetery in Crowley. The family has requested the visitation to be held on Sunday, February 3, 2019 at 10:00 A.M. until 10:00 P.M. in the Duhon Funeral Home Chapel in Crowley. Visitation will resume on Monday at 8:00 A.M. until time of services. Survivors include her husband, Conrad Hanks of Crowley; one daughter, Rhodessa, and husband, Joseph Credeur of Crowley; three sons, Blake Hanks and Courtney Reiners of Crowley, Daniel Thibodeaux of Crowley, Travis and wife, Kristie Hanks of Crowley; one brother, Rives Lavergne, Jr. of Crowley; ten grandchildren, Travis, Kylie, Gage, Tori, Taryn, Kayle, Tayden, Hayven, Ava and Gabe; one great-granddaughter, Jasmine. Cathy was preceded in death by her parents, Rives Lavergne, Sr. and Rosaline Navarre Lavergne; one brother, Donald Lavergne; her mother-in-law, Elvie Hanks. You may view the obituary, sign the guest registry and express condolences online to Mrs. Hanks’ family at www.duhonfuneralhome.com. We encourage you to share your most beloved memories of CATHERINE here, so that the family and other loved ones can always see it. You can upload cherished photographs, or share your favorite stories, and can even comment on those shared by others.